Na Stars Team Red take home Silver! NA Stars Team Red wins Gold at the 2016 CHCC! Vendy Pribylova (Czech National Team/UMaine Hockey East) played for Team Blue of the North American Stars. She was selected MVP of the entire Czech Hockey Challenge Cup! Bob o'connell, captain keira goin, and coach stephanie scarpato with the gold, 1st place trophy at the 2016 chcc! 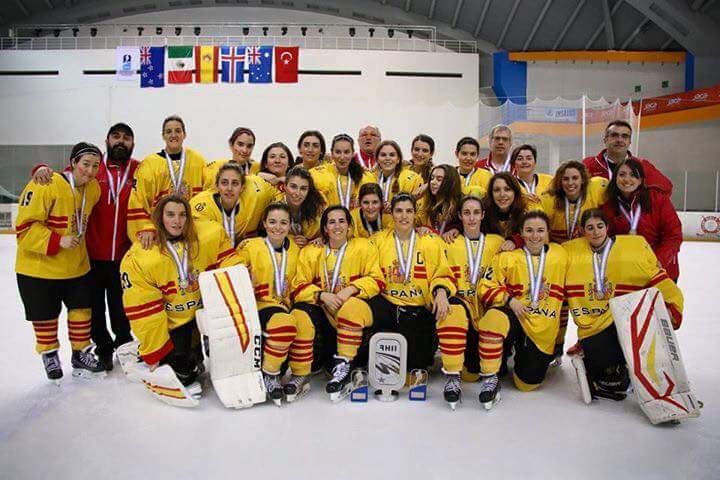 August 15th 2014 – The success of the NA Stars girls team did not go unnoticed: a local newspaper recapped the victory over the MK-Martin team from Slovakia in the Czech Hockey Challenge Cup Tournament held in Prague. A special eye was set on Arianna Bacon who was a major contributor in achieving this positive outcome of the game because of her goal. September 2013 – PRAGUE, CZECH REPUBLIC – Even during the heat of summer, several members of the Chatham University Ice Hockey Team found a way to compete on the ice. Morgan Becer, Kimberly Miller, andKaitlynn Smith recently traveled to Prague, Czech Republic to compete in a tournament featuring teams from North America, Russia, the Czech Republic, and Slovakia. Becer, a member of the North American Team Red, took the silver medal, losing in the championship game to a team from Russia. 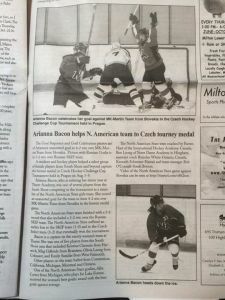 Miller and Smith were teammates on the North American Team Blue, whose highlights including overcoming a three-goal deficit in the third period of a game to earn a tie. When not on the ice, each team was able to travel throughout Prague and visit some of the most historical venues in all of Europe. All three Chatham players took a tour of the Bohemian Crystal Glass Factory, located in Prague. The tour included information on how the famous crystal is made and the opportunity to purchase crystal items. They also toured downtown Prague, several castles, and even walked across a bridge featured in the movie Mission Impossible. Chatham University, founded in 1869, is located in the vibrant Shadyside neighborhood of Pittsburgh, PA. Preparing students from around the world, Chatham’s enrollment throughout the past decade was the fastest growing in the Pittsburgh region. Consisting of a historic, undergraduate women’s college and graduate and online programs for both men and women, Chatham has consistently been ranked among the top master’s level institutions in the Northeast by U.S. News & World Report and The Princeton Review. Offering challenging academics and innovative programming in the fields of sustainability and the environment, the health sciences, and business & entrepreneurship, a Chatham education is designed to meet the needs of tomorrow’s economy, today. Chatham has also demonstrated institutional commitments to reach carbon neutrality by 2025 as a charter signatory of the American College and University Presidents’ Climate Commitment, has been named to The Princeton Review’s 2013 Green Honor Roll as one of the most environmentally responsible universities in the U.S. and Canada, received a STARS Gold Rating in recognition of its sustainability achievements from the Association for the Advancement of Sustainability in Higher Education (AASHE), and is the alma mater of environmental icon and Silent Spring author, Rachel Carson (class of ’29).